The Horizon T6 treadmill goes big on features – a large motor, 15% incline, and 400-lb user weight limit – and leaves off the frills. It is a good choice for runners & serious walkers looking for substance over entertainment features. The LED dot matrix control panel shows workout feedback in a 10" x 14" display. The 10 pre-set programs include manual, intervals, mountain climb, weight loss, pacer, custom, and 2 target heart rate workouts. UPDATE: The Horizon T6 treadmill has been phased out. 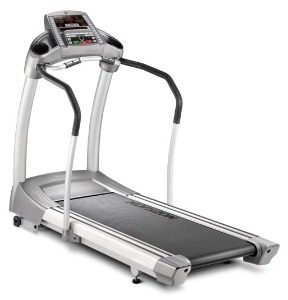 Take a look at the latest Horizon treadmills to find a comparable model. The Horizon T6 treadmill is a non-folding model powered by a quiet 3.0 CHP motor and features a 2.2mm orthopedic belt, a 20" x 60" running area, speed range of .5 to 12 mph in 0.1 mph increments, and a thick elastomer cushioning system. 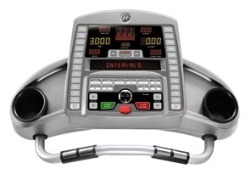 Reviews like how the treadmill stores training logs for up to two users – right on the machine, so you don’t have to download anything to a USB flash drive and transfer it to a computer, or sign up for an online membership. The Horizon T6 records monthly and lifetime mileage goals for up to 100 workouts, as well as calories and average pace. If you like a handy log of your training progress, you will like how the T6 does it for you. The Horizon T6 is $2,199 with great specs and a nice design, although it has an oddly weak parts and labor warranty for a machine this pricey. As Horizon’s best home model we would like to see it backed with something like a 5-year parts, 2-year home servicing warranty; otherwise, you will have to purchase extended coverage which will add to the overall price. The Horizon T6 treadmill is a nice machine for performance training, but the value slips because of the warranty. (As a comparison, Smooth Fitness offers a lifetime parts & motor warranty on its 9.65LC model, also priced at $2,199.) If Horizon could only improve the warranty, then it could start to compete with the leaders at this price, such as Smooth, Sole, Lifespan, and Precor treadmills. 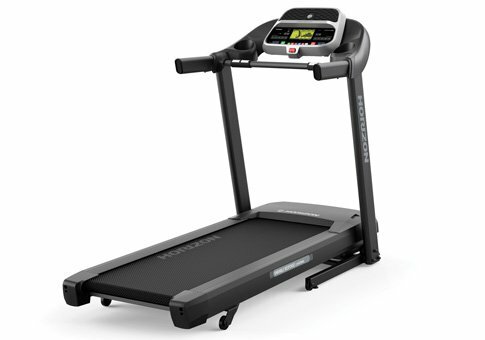 Most popular Horizon Fitness treadmills are on sale right now!